I think every person on earth, at this point, has heard of the iPad and the amazing things it can do. Its versatility is just amazing that’s why a lot of people from different walks of life and professions have found uses for it. Even those with different interests are being catered to by various iPad apps that relate to their interests. Gaming is one aspect of the iPad that has become one of its cornerstones. Without Apple’s devices, we wouldn’t even have Plants Vs Zombies or Angry Birds. Games are still being developed for the iPad that are really interesting, but arguably none more interesting than an augmented reality game. 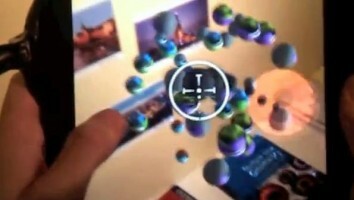 13th Lab, a software/gaming company from Sweden, has released an augmented reality game for the iPad. The game, called Ball Invasion, is essentially a shooting game but the cool feature is that it uses your environment as the setting for your battles. The guys at 13th Lab are not out to give Angry Birds a run for its money. In fact, they are doing this game as a way of bringing attention to what the company can do and then transform their technology as a jump off point for developers who may not have the expertise to create what the 13th Lab guys can do. Rumor: The Google Tablet to go after Apple’s iSlate?